As promised I made Ruth Reichl’s pork and tomatillo stew last night, and as predicted, it pretty much cured all ills. Well, besides my lingering hell-cough, but it DID improve my mood. AN ASIDE: Please notice my classy new IKEA runner in the background. It is intended for Christmastime, but I DON”T CARE. And I finally got rid of all my mismatched crazy grandma inspired (but not in a good way) plates and bought plain white ones. What. A. Relief. All that paisley and stone-print was making me feel less than stellar about my life. I’m serious. I am far too lazy to write the recipe, but it involved plenty of dark beer, orange juice, and far more cilantro than you’d imagine. 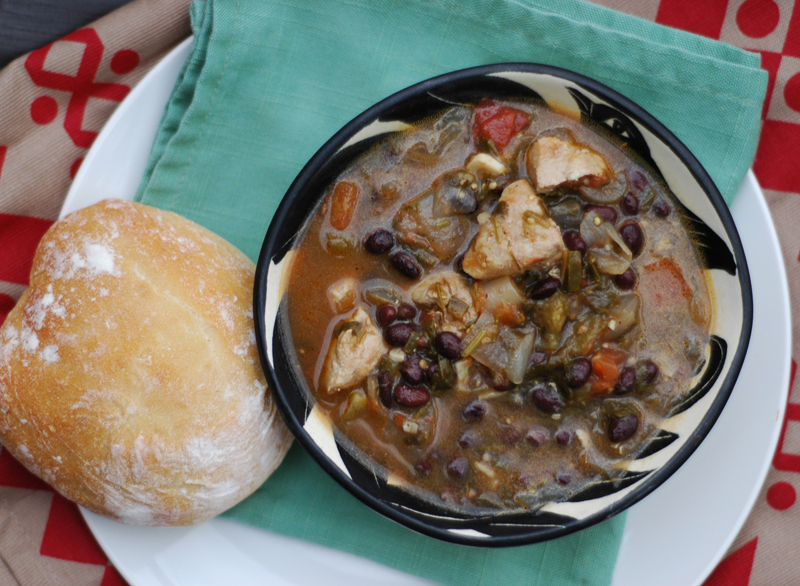 After you’ve added a ton of white onion, browned pork cubes, jalapenos, black beans and softened tomatillos… and I am a happy soup eater.